The new Nissan Titan XD — especially the metal-flake blue Platinum Reserve model — tends to stop dyed-in-the-wool truckers in their tracks – like the guy in a ball cap who halts me in mid-stride outside a store. “Is that a half-ton,” he asks, “or a three-quarter ton?” With pumped-up bodywork, a 5.0-litre Cummins diesel under the hood, my XD test truck has the bulk of a heavy-duty truck, a more than a 2,000-lb payload, plus a 10,608-lb towing capacity. But the answer is yes and no. Officially a light truck, the Titan XD is more hefty than most and offers trailer boaters the extra stability, security and tow capacity that usually comes only with a heavy duty truck. Prices range from $52,400 for a base S model to $73,900 for my Platinum Reserve test truck. Nissan introduced the diesel-powered XD version of a totally redesigned Titan model for 2016. The arguably tamer and more affordable gasoline-powered mainstream version of the Titan has been rolled out as a 2017 model and will be on sale this summer. 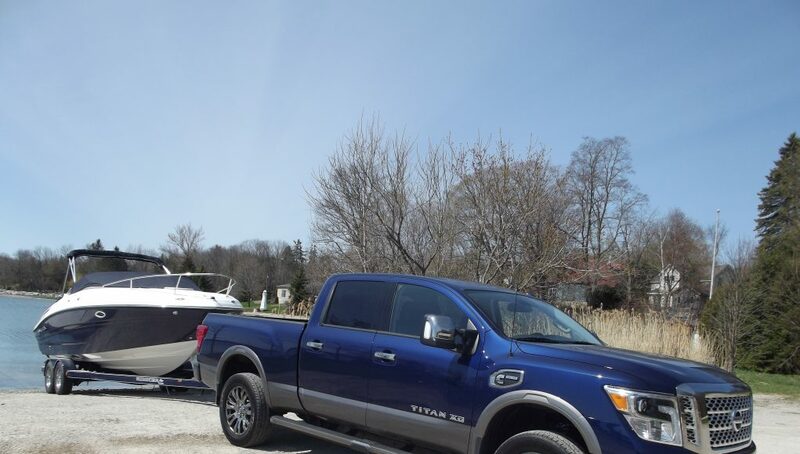 In the meantime, the 4X4 Crew Cab Titan XD has much to interest serious trailer-boaters, with towing capacity as high as 12,038 pounds in the S model. The Cummins diesel provides 310 hp, a whopping 555 ft-lb of torque and a throaty diesel roar that adds to the big-truck image. The engine makes a tangible difference on hills and the launch ramp during my tow test, with a Rinker Captiva 236 cuddy cabin in tow. With a twin-axle steel trailer it adds up to about 5,250 lbs, a reasonable workout for the Titan XD. Launching and retrieving is effortless in either two- or four-wheel drive. Pulling out into traffic is easy too, as the Cummins’ turbocharger kicks in with a slight but predictable delay. The XD’s tow-friendly features start with the RearView video monitor that lets you back down on the trailer singlehanded to hitch up. Trailer Guide lines keep you straight and the Around View monitor offers a bird’s-eye view of the truck’s position. There’s a choice of four- or seven-pin wiring connectors above the bumper and a light check system. On the road, Trailer Sway Control, Tow/Haul Mode with a downhill speed controller and a trailer brake controller are added safety and convenience features. The bottom panel of the split mirror virtually eliminates the blind spot and improves trailer visibility. In my care, the V-8 diesel got fuel mileage of 15.3 litres/100 km (18.5 mpg) on the highway and 16.5 litres/100 km (17 mpg) in a mix of in-town driving and boat-towing. With a 98.4 litre tank there’s plenty of range. The six-foot six-inch box has lots of room for gear. There are locking compartments under the 60-40 back seats and a fold-out flat floor feature. My test truck’s interior is spacious and luxurious, with butter-soft two-tone leather seats (heated and cooled in front, heated in the rear), the usual long list of electronic gadgets, and a killer stereo. As long as you can avoid cramped downtown parking lots, it’s no problem. A big truck can deliver confidence and comfort for trailer-boaters who routinely tow and launch sizeable loads. The Nissan Titan does it in style. This article is featured in the Summer 2016 issue of Boats&Places.